The young people who are the subject of this book are responsiblefor a disproportionate amount of difficulty for society. They arethe chronic rule-breakers and bullies. They may threaten,intimidate, manipulate, steal, and use violence to get what theywant. Many are drug abusers and drug dealers. Most have problems with self-control and self-discipline. Nearlyall of them are academic underachievers. Unfortunately, they arealso incredibly resistant to psychological intervention. Exhibitinga range of behaviors grouped under the DSM rubric "ConductDisorder," these children and adolescents are legion and theirnumbers continue to grow at an alarming rate. 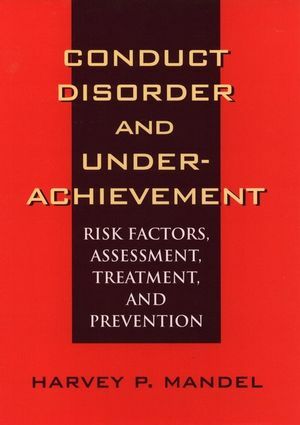 In Conduct Disorder and Underachievement, a leading authority on CDunderachievers explores the causes, assessment, treatment, andprevention of disruptive behavioral problems in underachievingchildren and adolescents. He summarizes many of the assessmenttools developed for CD underachievers and provides a unique,comprehensive risk-factor model which can be used to help identifydisorder problems before they occur. And, perhaps most importantly,he describes a dynamic cognitive/developmental treatment modelwhich has proven to be extraordinarily successful with certaintypes of CD underachievers. Conduct Disorder and Underachievement offers new hope for findingpsychological solutions to one of today's most pressing socialproblems. Much has been unearthed in recent years about the origins anddevelopment of conduct disorder (CD) in children and adolescents.Yet there is still considerable disagreement about the roleacademic underachievement plays in CD. Is underachievement acontributing factor to or a result of CD? While the jury is stillout on this issue, one thing is certain: eventually, therelationship between them becomes a dialectical one--bad grades andantisocial behavior usually go hand in hand. Can this seeminglyfacile observation provide the basis for interventions with certaintypes of conduct disorders? In Conduct Disorder andUnderachieve-ment, a leading authority on underachievement answersthat question with a resounding "Yes" and demonstrates how. Dr. Mandel begins with a thorough review of the latest researchfindings on the etiology, assessment, and treatment of conductdisorder in children and adolescents. From there, the focus narrowsto issues of CD underachievement. While most forms of conductdisorder and underachievement are discussed, the clinical emphasisis on less severely disturbed children for whom underachievement isstill manageable but, if left unchecked, can lead to more severeconduct problems. Through the window of two case histories completewith test results and diagnostic interviews, Dr. Mandel exploresthe full range of assessment issues, critically examinespredominant treatment strategies, and provides helpful preventionguidelines. In the prescriptive portion of the book, the author delineates acognitively oriented approach to treating CD underachievers. Heespouses a treatment strategy based on the assumption that, fromone case to the next, underachievement may either contribute to orresult from conduct disorder. The most constructive approach,therefore, is to reconstruct the unfolding of individual scenariosand then determine what can be done to mend fractured developmentalpathways. Through a series of therapy excerpts which take thereader inside a treatment session, Dr. Mandel brings to vivid lifethe issues that must be dealt with, the struggles that must beovercome, and the complex interactions that develop between childand therapist during therapeutic intervention. Combining a comprehensive review of the latest findings with adynamic new approach to intervention, Conduct Disorder andUnderachievement is a valuable resource for mental healthprofessionals, guidance counselors, and educators who deal withthis increasingly common problem. HARVEY P. MANDEL, PhD, is an associate professor of psychology and Director of the Institute on Achievement and Motivation at York University, Ontario. He attended McGill University and the Illinois Institute of Technology, where he received his doctorate in clinical psychology. His other books include The Psychology of Underachievement and "Could Do Better": Why Children Underachieve and What to Do About It (both coauthored with Sander I. Marcus), available from Wiley. Conduct Disorder: Criteria, Course, Risk Factors, and DifferentialDiagnosis. Academic Underachievement and Conduct Disorder. Individual Cognitive Therapy of CD Underachievers. Frequently Asked Questions about CD Underachievers.